Kiev has had a very unpleasant start to the New Year. With economic problems mounting, and the threat of renewed conflict in the Donbass looming, now, adding to their troubles, the Dutch plan on holding a referendum to see whether they can't reverse Amsterdam's ratification of the EU-Ukraine Association Agreement. The Dutch, it seems, aren't so thrilled about all the promises made in Brussels on their behalf regarding Association, and the much talked-about visa-free travel regime for Ukrainians. According to a recent survey by Een Vandaag, a popular current affairs program on the Dutch public television channel NPO 1, a majority of the country's citizens are opposed to the ratification of the agreement. Planning to hold an advisory referendum on the agreement in early April, the Dutch are throwing a wrench into Brussels' plans, leading European Commission President Jean-Claude Juncker to warn that a 'no' vote on association might cause an EU-wide 'continental crisis'. The referendum, it's worth recalling, was the initiative of Dutch Euroskeptics, who managed to collect over 400,000 signatures last September, taking advantage of a new democratic tool which allows citizens to call for a plebiscite on recently-adopted laws or treaties. Een Vandaag's survey, which polled over 27,000 residents, showed that the majority of Dutch citizens are likely to vote to reject the treaty, with 53% of those asked saying they would "definitely" do so, and 17% noting they were "likely" to do so." If the referendum receives over 30% turnout, its status must be considered official. In theory, the referendum is only advisory in character, and the government might still ignore it. However, in practice, experts suggest, doing so would mean a serious blow to the government's approval ratings. 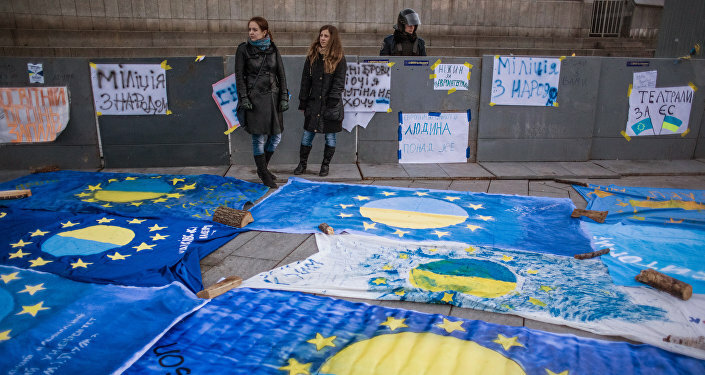 In November, Dutch Prime Minister Mark Rutte said that the referendum would not stop Ukraine's European integration, but turned around and added that the government would still take account of the results. Since then, the government has decided to launch a campaign in support of the Association Agreement, which came into force on January 1. According to some critics, the government will now be doing everything it can to discourage sufficient voter turnout. Speaking to Dutch evening newspaper NRC Handelsblad, Joop van Holsteijn, a professor in electoral research at Leiden University, pointed out that a record low sum –only 20 million euros, has been allocated to municipalities to carry out the referendum (in contrast to the last parliamentary elections, where municipalities received over 42 million). "I see this as childlike pettiness. The law on the referendum is there, and people have the right to use it," Holsteijn complained. Commenting on the roots of the Dutch people's negative attitudes toward post-Maidan Ukraine, independent Russian newspaper Svobodnaya Pressa suggested that the story, running late last year, on the discovery of stolen paintings from a Dutch museum in the hands of pro-Kiev 'nationalists' in east Ukraine plays an important role. "Late last year," the paper notes, "NPO 1 reported that a collection of 24 works, and a large amount of silver stolen 11 years ago from a museum in Western Friesland had wound up in the Donbass, in the hands of a pro-Kiev 'nationalist group'. The men refused the museum's offer of 50,000 euros to get the pieces back, demanding at least 5 million euros. Moreover, according to the report, Oleh Tyahnybok, a Ukrainian politician and former Rada MP from the Svoboda Party, and former Ukrainian Security Service Head Valentyn Nalyvaichenko [two formerly key figures in post-Maidan Kiev] were tied to the crime." Speaking to the newspaper, Alexei Kuznetsov, the head of the Center for European Studies at the Moscow-based Institute of World Economy and International Relations, emphasized that he is convinced that in any case, "every effort will be made to persuade people not to vote against [association]. The EU has seen many cases of the manipulation of public opinion before, and Brussels is quite capable when it comes to conducting information warfare against its own population." As for Juncker's prediction that the referendum might cause a 'continental crisis' if the Dutch vote the wrong way, Kuznetsov noted that "many intelligent people in the West, including in the EU, already understand that supporting the coup d'état in Ukraine was a big mistake. It led to the partial collapse of an EU neighbor which had been relatively stable up to that point…Still, given that Ukraine is not a member of the EU, whatever the outcome of the referendum will be, it will not cause a crisis in the EU itself." Juncker's words, the analyst suggested, are an example of the kind of information warfare he's talking about. "This is an attempt to intimidate the Dutch and to impose on them the 'right' kind of behavior –from the EU leadership's point of view. There is nothing to back up these words…"
For his part, Boris Shmelev, Deputy Director of the Diplomatic Academy of the Russian Foreign Ministry, is more pessimistic, suggesting that too much is at stake for the EU establishment, and that nothing will be able to stop the agreement from going ahead. "The West in general and the leaders of major European countries in particular have invested a great deal of effort and political capital in the formation of the Association Agreement. For them, any setbacks – a refusal to sign or even a delay, would be highly undesirable. It would mean a powerful political defeat for the EU leadership, and for the entire policy of the EU in Ukraine and the entire former Soviet space." "Every effort will [therefore] be made," according to Shmelev, "to change the mood of the Dutch people with respect to the agreement." Ultimately, Svobodnaya Pressa suggests that with the referendum now less than three months away, the big question is: "will the Dutch and European authorities be able to convince the Dutch people that the Association Agreement with Ukraine is a good thing? And if not, will they at least take account of the results of the referendum, or will the geopolitical agenda find itself to be more important than the vaunted values of European democracy?"